Over 2000 years ago during the 3rd century BC, the son of India's King Asoka, Arahat Mahinda, came to Sri Lanka. Converting King Devanampiyatissa, Sri Lanka went through a social transformation. 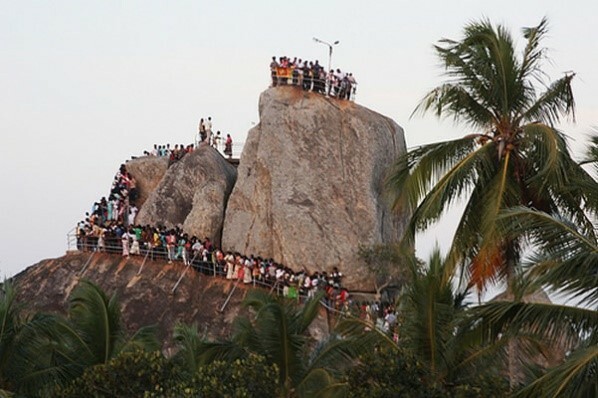 A principal symbol during this event is Mihintale; a mountain 220 km (135 mi) north of the modern-day capital, Colombo, 15 km (9mi) west of Anuradhapura. It's the location where Mahinda, the missionary monk of the kingdom, preached Sri Lanka's first Buddhist sermon to the king, which formally introduced Buddhism. Anuradhapura is an ancient capital and one of Sri Lanka's eight UNESCO World Heritage sites. Let's imagine the scene as you first arrive in Sri Lanka's capital, Colombo. You're entranced by the bright pandals which are colorfully painted stationary structures with tens of thousands of multicolored lightbulbs. The pandals portray various scenes from the Jātaka tales which serve to teach and enlighten the public about the previous births and lives of Gautama Buddha. Siddhartha Gautama was a prince in the 5th century BCE who came across the unfortunates outside the palace: sickness, old age, suffering, and death. From there he journeyed to reach Enlightenment. Upon reaching it, he taught others of a Middle Path, between sensual indulgence and the extreme asceticism. As a businessperson you don't have to understand the scenes, but it is a beautiful sight to behold and one well worth viewing while they are illuminating the evening streets. 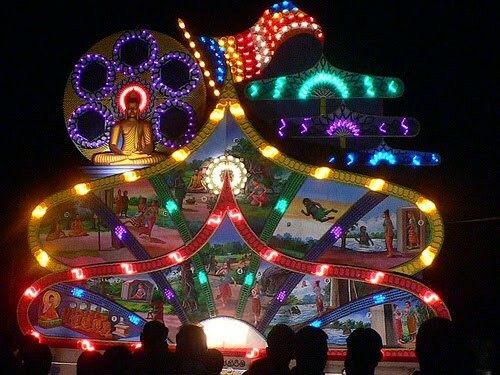 The ancient cities of Anuradhapura and Polonnaruwa, the Temple of the Tooth in Kandy, and the Kelaniya Temple are specific areas of Poson celebration. Sri Lanka has a long and intriguing history. Impress your potential business partners with your knowledge of the ancient ruins and the significance of the different temples. As you travel by three-wheeler, bus, or car, observe see roadside dansals handing out food and drink. Enjoy the food, culture and socializing. A custom during Poya days is the lighting of intricate paper lanterns shaped like stars or lotus flowers known as kūdus. For Western travelers, showing appreciation in the beauty of the pandals or kūdus will instill a sense of respect for culture. Poson is a high-traffic time with thousands on the streets. In addition, just like any other Poya day, businesses are usually closed, and alcohol and meat sales are forbidden. Take time to enjoy the customs and culture as you further your cross-cultural relations. It's important for Western business visitors to have a basic understanding of the Poson customs as you share your business ideas and values. Embrace Sri Lankan customs by participation to build trust inspire respect and create long-lasting business relationships. Sharon Schweitzer, J.D. wrote this article with the valuable insights of UT San Antonio student Savin Weerasinghe. Feel free to connect with Savin on LinkedIn. Sharon is a cross-cultural consultant, an international protocol expert and the founder of Protocol & Etiquette Worldwide. She is accredited in intercultural management, is the resident etiquette expert for CBS KEYE We Are Austin, popular on-air contributor, regularly quoted by BBC Capital, Investor's Business Daily, Fortune, Inc., The New York Times, The Vancouver Sun, and numerous other media. She is the best-selling, international award-winning author of Access to Asia: Your Multicultural Business Guide, named to Kirkus Review's Best Books of 2015.